Data from the 2014 Maryland Report Card suggest that Prince George’s County’s public charter schools and specialty programs do not fully reflect the demographics of the county school system, serving significantly fewer elementary school1 students who qualify for special services than the PGCPS average. As of 2014, about 70% of Prince George’s County elementary school students qualified for free and reduced meals (FARMs). Students with limited English proficiency and students receiving special education made up 20.9% and 10.4%, respectively, of the county’s elementary school students. But the demographics of the county’s public charter schools and lottery specialty programs look substantially different. In the charts below, both generated from the long table at the end of the post, each of PGCPS’s elementary and K-8 schools is represented by a single point. Points colored in red represent public charter schools, while points colored in black represent the lottery specialty programs: French immersion schools, Montessori schools, and schools for the performing arts2. In the first chart, points farther to the right indicate schools with a higher percentage of FARMs qualifying elementary students. Points closer to the top of the chart indicate a higher percentage of limited English proficient students. 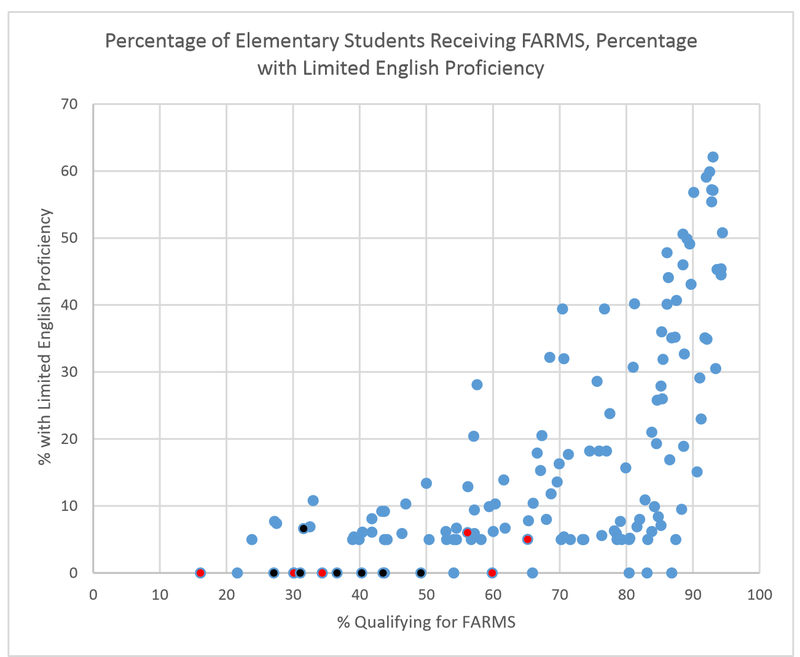 Scatter plot showing the percentages of FARMs and LEP elementary students for all of PGCPS’s elementary and K-8 schools. Points in red represent charter schools; black represents specialty programs. 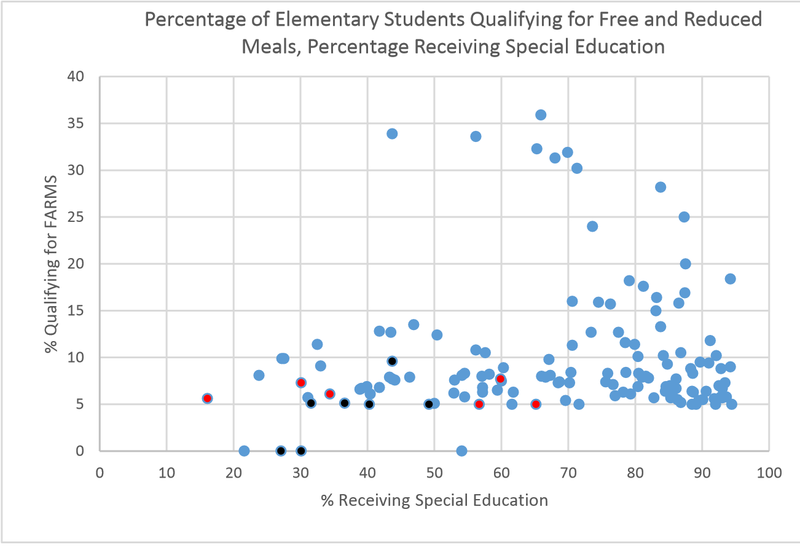 The chart below shows the percentages of elementary students receiving FARMs and special education, respectively. Points closer to the top of the chart represent schools with more special education students. All of the charter schools and specialty programs fall below the county average for percentage of FARMs qualifying elementary students. Turning Point Academy Public Charter School comes the closest to the 70% county average, with 65.2% of its elementary students qualifying for FARMs. The county’s four Imagine charter schools come in at 16.1%, 30.1%, 34.4%, and 59.9%. For all four Imagine Schools, the number of limited English proficient students is small enough that it is represented by an asterisk on the Maryland Report Card. (See footnote 5 for details about special enrollment limitations at Imagine Andrews.) The percentages of FARMs qualifying elementary students at PGCPS’s three Montessori schools are 27.1%, 30.1%, and 36.6%, respectively. In the table below, Prince George’s County’s public elementary and K-8 schools are listed, in ascending order, according to the percentage of elementary students receiving free and reduced meals. The percentages of elementary students with limited English proficiency and elementary students receiving special education are also noted. Public charter schools are highlighted in the table in red, specialty programs (i.e. French Immersion, Montessori, performing arts) are highlighted in black, and talented and gifted (TAG) centers are highlighted in green4. Data source is the 2014 Maryland Report Card. 1The Maryland Report Card disaggregates data for elementary, middle, and high school students. For K-8 schools, for example, demographic data is given for elementary and middle school students, not for the school as a whole. 2The 2014 data predates the opening of the county’s new Spanish immersion and dual language programs. ‘*’ indicates no students or fewer than 10 students in category, or ‘*’ indicates the percentage for the category is either ≤5 or ≥95 and the corresponding counts have been suppressed. 4Heather Hills and Glenarden Woods Elementary Schools, highlighted in brighter green, serve only TAG identified students. The light greyish-green color indicates schools that have a TAG magnet program but also serve some students who are not TAG identified. This data, from 2014, predates the opening of PGCPS’s new Spanish Immersion and Dual Language programs. Images are credited to Genevieve Demos Kelley. The Evolving FY 2016 Budget: The Requested Budget is Not Fully Funded, So What Happens Now?